If You Are The Boss, Marketing Manager Or CEO And You Found Helicopter Links Website On Your Own, Don't You Owe It To Your Company To Advertise With Us? (San Diego, California, USA): While I'm not trying to offend anyone, would you please allow me to make my case? If you found Helicopter Links website on your own and you are the boss of your own company, a marketing manager (or someone in your advertising or marketing department), a CEO or anyone else with clout in your company and you are not advertising with us, let me make the proposition that you are hurting your own company by not advertising with us. Here's my proposition: There are millions of websites online. By you finding Helicopter Links website, you have simply proven to yourself (whether you have the fortitude to admit this or not) that Helicopter Links is Search Engine Optimized well enough, that people in the helicopter industry find us. As a sales person in advertising business, it is my job to contact potential advertisers to "make the sale." However, while I attempt to contact as many companies in the helicopter industry as possible each year, I miss out on calling on thousands of our potential advertisers annually. This is because I simply don't have the staff to call every company in the helicopter industry and ask them if they want to advertise with us. And most people are aware, there are many companies which have a very strong, thick and tall wall between the boss and sales people. If your company is serious about advertising to potential new customers, it is the boss's or marketing manager's responsibility to seek out and find good companies to advertise with. Just because we have not called your company doesn't mean that you should refuse to call us when you found our website. If you have never advertised your own company, it can be a scary thing. You don't know if the advertising will work, you don't want to get "ripped-off" by an advertiser, you don't know how you'll make the ads, you are not sure where to advertise and things of this nature. Denying your company to advertise due to fear, is not going to help new customers find your company! I have provided answers (below) address as many fearful thoughts that some business owners and marketing people might have brewing in their mind. Advertising is something businesses have been doing for many, many decades. If other businesses advertise, your company can advertise as well. Advertising is one of the best ways for new customers (and former customers) find your company. You can advertise to buyers, in the helicopter industry, searching for sellers, by advertising on Helicopter Links website. I've been in the advertising business for many years and I am very willing to answer any questions you may have concerning advertising on Helicopter Links. I am also willing to discuss the benefits of advertising in helicopter magazines, trade shows, using mailers, and any other advertising, marketing and branding techniques that you'd like to talk about, including the benefits of social media. 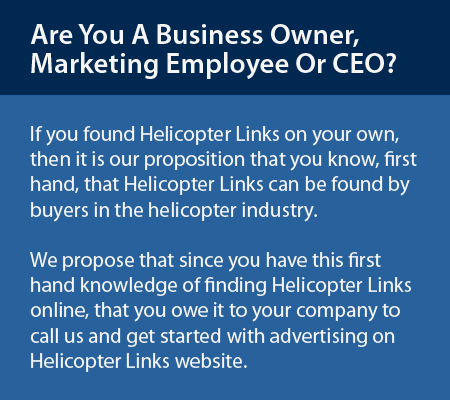 If you are a helicopter operator, helicopter manufacturer, supplier or service company, Helicopter Links is the right place to advertise online because Helicopter Links is a unique directory which was specifically made for the helicopter industry. Our visitors are from outside and inside the helicopter industry. Those outside the helicopter industry are contractors, construction companies, demolition companies, government agencies, pipeline companies, utility companies, oil companies, private citizens and more, looking to purchase the services from helicopter operators. Those inside the helicopter which visit our website are helicopter operators (looking for suppliers and services), helicopter manufacturers and many other companies within the helicopter industry. Our advertising pricing is very fair on Helicopter Links. Every company charges prices for their products to pay for their products, employees, computers, expenses and more. We charge for advertising on Helicopter Links the same way that all other businesses charge for their products and services. When we quote advertising prices, we look at your business website, ask you about what parts of your business that you want to advertise and we make a customized advertising quotation for you. You then can review it and either accept it or we can revise it. Once you approve of the advertising quotation, we invoice you, make your banner ads and place your advertising on Helicopter Links website. Want a general idea of our pricing? Let me please first talk about the price of helicopter trade shows. A helicopter trade show might cost a smaller company around $10,000.00 USD to $20,000.00 USD or more, for a three (3) days only trade show! (Remember, the cost of a trade show includes but is not limited to: air fare, hotels, transportation, shipping, the cost of the booth, food, trade show give-aways, flyers, business cards, booth signage, booth decorations and etc.) For larger companies the cost for a trade show can be in the millions of dollars. Helicopter Links pricing is very affordable. The price of advertising for a small to medium sized business on Helicopter Links website would typically be in the range of $2,000.00 USD to $5,000.00 USD per year. Your pricing depends upon how many different web pages your ads will be place. And the price for advertising lasts for a full 365 days! One full year! (Our prices can be as low as $552.00 per year, that is, if you are advertising on only one web page on Helicopter Links website. The pricing depends upon how many web pages your ads are on.) An exception to the rule is the pricing for helicopter manufacturers. Their prices are higher and helicopter manufacturer pricing is in the range of $35,000.00 USD per year. Here are some of the advantages and benefits, when companies advertise on Helicopter Links website. Over 80% of our visitors are buyers searching for sellers. That means that most of our visitors want to look at your banner ads and advertising. Our visitors are from outside and inside the helicopter industry. This means that helicopter operators will be advertising to any company, government or private individual seeking their services. This also means that helicopter operators and other companies in the helicopter industry will be searching our website for helicopter related vendors as well. Our visitors are not only looking for suppliers and services, they are also looking for helicopter trade show information, helicopter magazines, helicopter associations and other information and by advertising on Helicopter Links website, you'll have many people viewing your advertising. The only banner ads allowed to be placed on Helicopter Links website are from companies which serve the helicopter industry. Our visitors to feel comfortable to read and click on the banner ads on Helicopter Links since they are all banner ads are helicopter related. Our web statistics show that many people do click on the banner advertising here. Visitors will never see restaurant ads, plumbing ads, off beat ads, offensive advertising or any other type of non-helicopter banner ads on our website. This stops confusion and/or frustration for our visitors. If you notice, there are many listings of companies on Helicopter Links website. This is the format of a directory. All our free listings are placed on Helicopter Links by our staff. No company can add their own listing. Then companies which advertise gain more clicks than the free listings because banner ads stand out among the listings. Our clients also have the option to have several sales-only posts each month on Helicopter Links Facebook and Twitter pages. We will also post relevant articles about your company and press releases for your company, if you choose to use this service we offer. Companies which advertise with us not online have banner ads on our website but they also have sales posts, monthly on our Facebook and Twitter pages. We can make your banner ads and help with the wording for your ads at no charge. Or you can make your own banner ads, it's up to you. I hope this article helps you see the advantages on advertising with Helicopter Links website. Please feel free to call me to discuss your advertising needs, and we can offer our advertising options and prices to you. Please call us at +1 (858) 413-7074 (San Diego, California, USA) or email us at staff@helicopterlinks.com and let's discuss how Helicopter Links can help you advertise to buyers in the buying process, in the helicopter industry.